FIG Council announces the bidding material for the Working Week 2023. All member associations are encouraged to consider to submit a bid. Election of the destination will take place at the Working Week and General Assembly 2023 in Hanoi, Vietnam. Then it is now time to consider to submit your bid to host the FIG Working Week 2023. The FIG Working Week 2023 will be the first event for a new term of leadership where the Council and Commission work plans will be revealed. 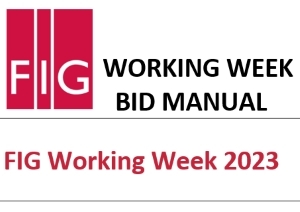 The bidding material for the FIG Working Week 2023 is now out. At the FIG Working Week 2019 that will take place 22-26 April 2019 in Hanoi, Vietnam there will be election of the destination for this major FIG event in 2023. Presentations of bids will be done on the first General Assembly day on 22 April 2019 and election among all member associations will be on 26 April 2019. Please contact Louise Friis-Hansen for details and questions and to submit a bid. Presidents meeting at FIG Congress 2018 in Istanbul, Turkey.